Fraudsters are everywhere. They’re in luxury and everyday stores on the high street. And in the charlatan stranger’s voice on the other end of a telephone line you dared to answer. In the ecommerce space, they’re hiding behind enemy lines with Internet-enabled desktops and laptops… just waiting to pounce. Not all battlefield enemies reside in far-away places. In today’s payments arena, the battle rages on against high risk ecommerce merchants — who strive only to make an honest living. Too often, battles erupt in the ecommerce ecosystem as bad guys try to topple good guys who aren’t trained to counter enemy moves. The most egregious bad guys use the initials C. N. P. on their battle plans and strategic maneuvers being waged to counter CNP fraud prevention. Those three little initials say it all: Card Not Present. Advances in technology seem to stymie their efforts and push them back for a while, only to give way as bad guys’ know-how catches up. Napoleon Bonaparte once said, “The battlefield is a scene of constant chaos…” High risk ecommerce merchants know just what he meant. 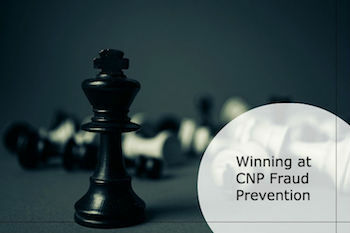 Let’s take a look at the CNP fraud prevention best practices available to help control the chaos on your CNP battlefield. Is Card Not Present (CNP) fraud rampant in your high risk ecommerce business? Merchants in that space — who don’t practice the fine art of CNP fraud prevention — answer too frequently in the affirmative. These best practice fraud control tools and chargeback prevention mechanisms can help to address the chaos in your CNP battlefield. Always require Address Verification (AVS), Card Code Verification (CVV), and IP Address verification in your payments gateway and online payment portal. These security protocols compare the IP location from which the transaction is entered to the card’s actual billing address location, and the actual billing address with the address the payment card user enters online. Robust CNP fraud prevention requires the purchaser to enter the CVV value from the payment card to complete the transaction. Screen your payment gateway for fraudulent transactions using a robust, recurring process. When screening transactions, look for certain order characteristics that may indicate ecommerce fraud. These include very large orders and requests for rapid delivery. Be sure to require strong passwords that meet best practices for ecommerce fraud prevention (if your website allows customers to create online customer profiles to simplify repeat orders). Best practices include a minimum number of characters, and a combination of letters, numbers, and symbols. Develop and document a robust fraud prevention policy and showcase it on your ecommerce website. Fraudsters are less likely to try fraudulent activity on a site when they know the merchant practices actively good CNP fraud prevention. Retain a copy of all transaction receipts and product shipments for your records. To dispute a chargeback and facilitate resolution, you’ll need to submit copies— within a limited timeframe after notification. Store the records somewhere safe and convenient. Treat Your Customers Well. Merchants are in control of their customer service practices. Poor customer service is often the root cause of chargeback issues. Manage and improve it to retain customers and reduce your chargeback rate over time. Be sure products and services are as described. Your payment process should be easy to use and include appropriate security measures. Communicate well with your customers. Confirm orders and shipments by email (and retain copies). Require customer signatures on order deliveries. Use your business name as the billing descriptor so it’s recognizable to customers. What’s New in CNP Fraud Prevention? According to a new white paper from the U.S. Payments Forum, 3D Secure (3DS) and email address verification will be applied in 2017-2018 along with legacy authentication methods (like CVV and AVS). Despite available technologies, MRC study data (the whitepaper’s basis) shows that currently only 8-15% of CNP transactions are still being screened manually in the 10 countries reviewed. In addition, tokenization, behavioral analytics, 3DS, and digital fingerprinting caught the attention of US ecommerce merchants and issuers. These CNP fraud prevention tools for future battles are leading-edge today. Don’t let CNP fraudsters lay waste to your backyard landscape. Learn to practice CNP fraud prevention and protect your business. You can gain the upper hand in the CNP battlefield and control the chaos. Make a move toward fraud-free payments operations and implement robust CNP fraud prevention mechanisms discussed above. Your payments processing partner should help you understand and implement mechanisms to combat fraud and prevent chargebacks. That’s in your best interest, and so ultimately in his too.